It's a bird… It's a plane… It's a…… KID!!! A concert tour in China, playing Chopin's Preludes Op.28 as well as his Piano trio Op.8 and the Cello sonata Op.65, with Nitai Zori (violin) and Inbal Segev (Cello). November 4, 2010 – Concert I - Wenzhou, China. A state of the art concert hall, with a beautiful new 9 foot Fazioli. What is this? Where am I? Who are these "little" people? Are these kids? Young kids?! Is this yet another one of my school visits? Community outreach? I am confused! It is 7:30pm, at a classical concert, and my audience consists of 400 people most of them children with their parents. Concert halls are for people with gray hair, remember? "Retired people and their parents…"
Nothing prepared me for this. I am playing for children at a formal evening concert! They want to clap, they want to ask, they want to listen, they want to absorb, and I feel that I am being sucked into a surreal reality – Utopia! I open up completely. I am totally relaxed. It feels natural. I have never been to this place, let alone heard of it, and within an instant it becomes an experience never to be forgotten. 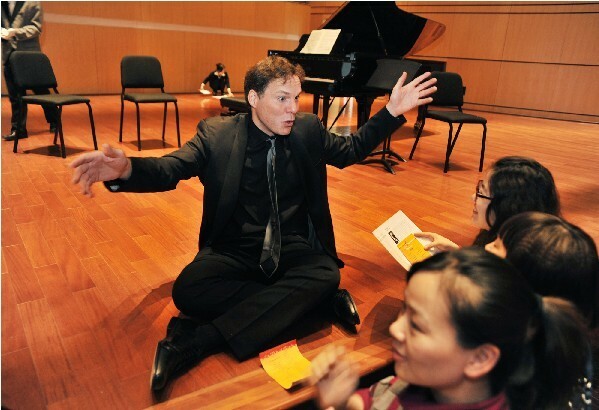 I propose to have Questions & Answers with the audience following the concert. When it finishes shortly after 10pm most of the kids go home, while the students are staying as well as some adults. They ask fascinating questions – "how can we make practicing interesting? Does music need to have a story? Why do some of the preludes have descriptive titles? Who gave them? Will a piece benefit if it had a title?" November 5, 2010 – Concert II – Wuhan, China. A state of the art concert hall, with a beautiful new 9 foot Steinway. 1200 people in the audience, most of which are very young. These people do have a choice. They can do other things, go some place else, but they choose to come to listen to a concert instead. At the dinner after the concert I ask for an explanation. Answer: "the old people don't know much about classical music so they are less likely to come, but for the young ones this is something new and exciting, and they are very hungry for it". Interesting answer, though, there has to be more. November 6, 2010 – Concert III – Zhengzhou, China. A state of the art concert hall with a beautiful new 9 foot Steinway. By now I start to believe audiences here are mostly young people. Result: indeed. Consequence: I play better. I grow. We all grow. My colleagues feel the same. November 7, 2010 – Concert IV – Beijing, China. Forbidden City concert Hall. Beautiful Steinway. About 1000 people come today. Now I am in a "Hope mode". Hope that we (out west) learn how to turn our priority system to include regular attendance of concerts with our kids. I am sure that the parents of these kids here in China work as hard as we do, and still they find the time and strength to take their children to listen to a classical concert. We have to do the same if we care about this music. I also hope… to be back here.